Enterprise service management deals not only with IT processes, but also with interrelated end-to-end business processes. Its main goal is to put into motion policies crafted by senior management in accordance with a specific governance framework in order to bring value and cost savings across the enterprise. It is important to note that these policies need to be re-evaluated on a periodic basis due to changing needs (hence the need for continual service improvement). An example of the good use of enterprise governance policies is dealing with the standardization of productive processes (which could be for example in manufacturing, logistics, or the automotive industry). In this case, a high level of flexibility and customization is crucial for the successful implementation of your designed workflow. Rigid approaches to such a difficult task are not going to work. The paradigm has changed, and nobody will force the enterprise to adopt ITIL v3 practices or the COBIT framework or anything else, since this will require too much effort and time. What is more likely is that ITIL and COBIT will change their focus to suit Enterprise needs. You need to meet stakeholder needs simply because you need to balance benefits, risks and resources to support your business by finding the desired outcomes. This is where you are going to interview all the stakeholders and compare their needs to the policies crafted by senior management. Covering the enterprise end-to-end means assessing the current state of the enterprise by focusing on risks, budget and cost management, change management, and service agreements. Nothing more, nothing less. Enlarging this assessment will put too much effort onto your own shoulders. And you need to apply a standardized model to reduce complexity and to avoid late and over-budget delivery. Finally you need to be able to measure the outcome of your work to reduce the gap with your business and gain the commitment of senior management. You will cover your Enterprise end-to-end business needs by applying EriZone customized processes and templates in order to standardize your Enterprise model and reduce complexity in a multi-tenant environment. And then you need to verify the success of your strategy by measuring cost savings and the end user experience through effective NetEye reporting and dashboards. 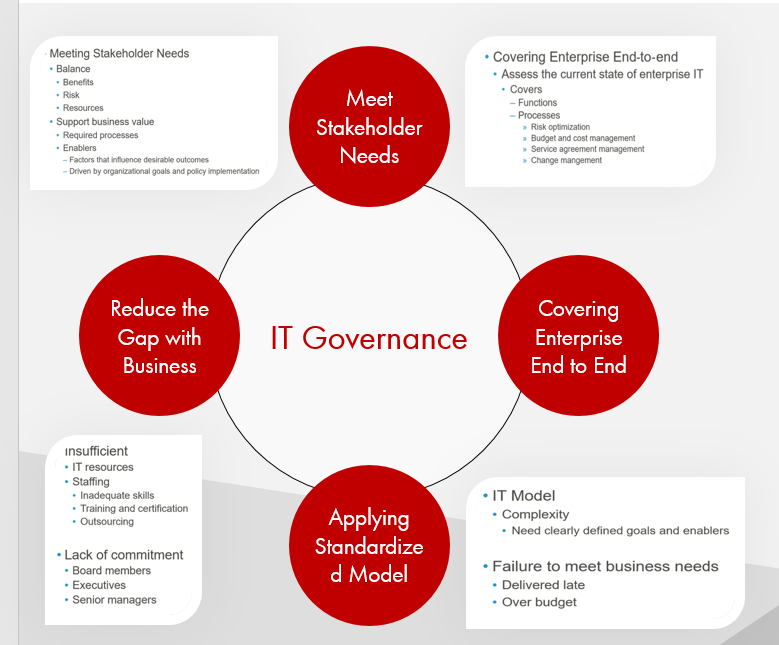 This is how you can focus on the application of the IT Governance principles through the effective use of NetEye and finally meet stakeholder needs.